Aeroflot has complained about repeated failures in the chasis and wing slats of Russia’s newest passenger plane. The Federal Agency for Air Transport suspended four out of 10 licenses for the SSJ 100 aircraft delivered to Russia’s largest airline, Aeroflot, due to reported failures in the planes’ chassis and wing slats. The Sukhoi aviation company is working to correct these issues, but now risks losing a number of its international clients if the problem reoccurs. Signs that the Sukhoi Superjet project had been experiencing difficulties became evident in a recent Aeroflot presentation, which drew attention to the fact that the number of incidents involving Aeroflot planes in 2012 increased significantly — from 60 to 95. Sukhoi Superjet 100 (SSJ 100) aircraft accounted for 24 of these incidents. Aeroflot representatives have declined to comment on the data, noting that the matter has not been discussed by the board of directors. During the time that it has been in commercial operation, SSJ 100 aircraft have experienced problems with false positive leak detection system readings, faulty wing slats and landing gear failures. “At the present time, work is being carried out to correct issues reported in previous service bulletins,” a Sukhoi Civil Aircraft spokesperson said. The head of the Federal Agency for Air Transport, Alexander Neradko, noted that there are no further plans to ground the Superjet. The suspension of commercial operations may result in a drop in orders for the plane, particularly from abroad — meaning that state funds used for the development of the aircraft will have to be returned. According to official Sukhoi data, a total of $1.09 billion has been spent on the project, $414.3 million of which has come from the state treasury. Sukhoi’s vice president of finance, Yevgeny Konkov, maintains that around $2 billion was spent on the initial stages of the production alone. The baseline version of the SSJ 100 is designed to carry 95 passengers up to distances of 1,893 miles. Russia’s Aeroflot and Armenia’s Armavia were the first companies to place orders for the plane. The Sukhoi Civil Aircraft order book now contains contracts for the delivery of 174 planes to various countries. A source at Sukhoi said that Aeroflot received a significant discount on the purchase of the Superjet, acquiring the aircraft for $16.6 million (reduced from the list price of $25 million, and the $27 million for new contracts). “In order to offset the losses on that particular contract,” a source at the company says, “we need to sell three planes for every plane sold to Aeroflot.” This means that Sukhoi will only break even in 2015. 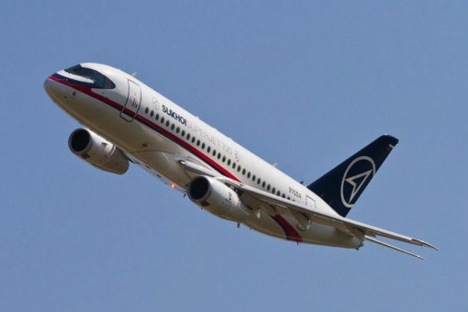 Sukhoi is also responsible for repairs and maintenance of the Superjet, despite the low-selling price of the aircraft. The company even promised to reimburse Aeroflot for losses incurred as a result of the planes being out of service. According to estimates, this works out to $50,000 per day. If Aeroflot decides to forego the Superjet contract, then it will be forced to look for similar planes overseas. In this case, the company will be unable to reach its passenger growth targets, which had been projected to repeat the 20 percent growth shown in 2012. The Avia Solutions Group chairman of the board, Gediminas Žiemelis, believes that Aeroflot could use planes like the SSJ 100 to help create a low-cost subdivision of the market.